Nature’s benefits extend beyond providing habitat — trees cool hard surfaces, filter out pollutants from stormwater and reduce air pollution. Access to nature has also been shown to boost recovery time for those in hospitals, reduce stress and anxiety and improve children’s performances in school. The importance and benefits of nature is not lost on the Friends of Hawthorne PTA — the re-envisioning of the school grounds revolved around nature and natural play areas. 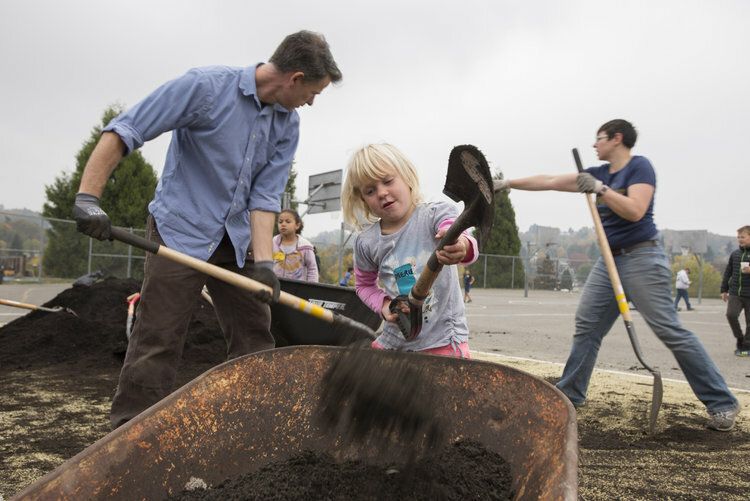 Once an asphalt playground, the community, students and Friends of Hawthorne PTA collaborated with the Pomegranate Center to design a depaved space where they could construct a natural sanctuary, including nature-filled play areas as well as a welcoming community space for the entire neighborhood to enjoy. Hawthorne Elementary is a Title I school in Columbia City, a diverse community with strong ambition and great leaders. 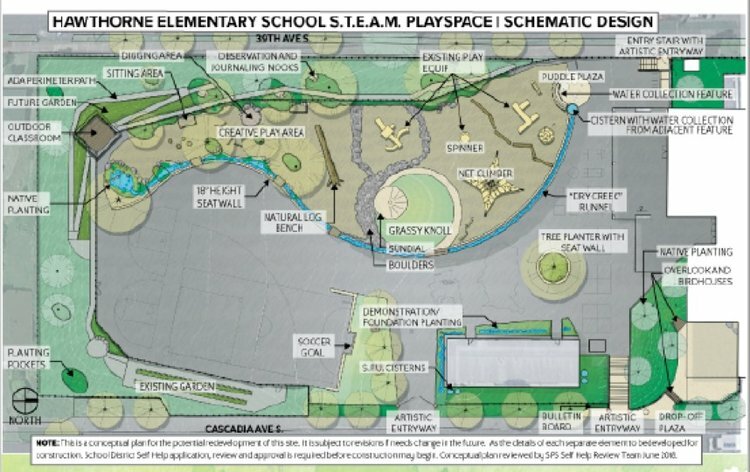 In 2017, the Hawthorne community and student body came together to develop a master plan to transform the playground. This project is designed to provide Hawthorne students and the community a new and diverse natural space to play, learn and grow. Their goals include replacing large-scale impervious pavement with natural wood fibers, constructing new multipurpose spaces and planting more than 25 new trees and other native plants. This new playground and community space is also incorporated into a STEAM (Science, Technology, Engineering, Arts and Math) learning opportunity for the students of Hawthorne Elementary. 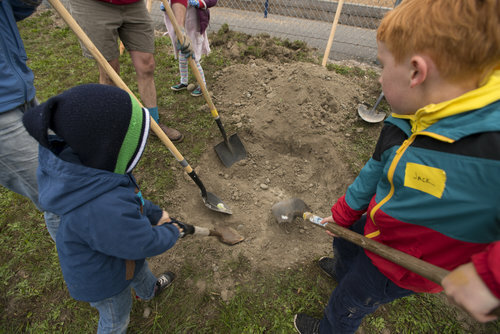 Both inside and outside the classroom, students are participating in the remodel, and the Friends of Hawthorne PTA and elementary educators are connecting students to nature and engaging youth in environmental education and stewardship. Transitioning the Hawthorne Elementary playground will have enormous benefits to the school and nearby community. 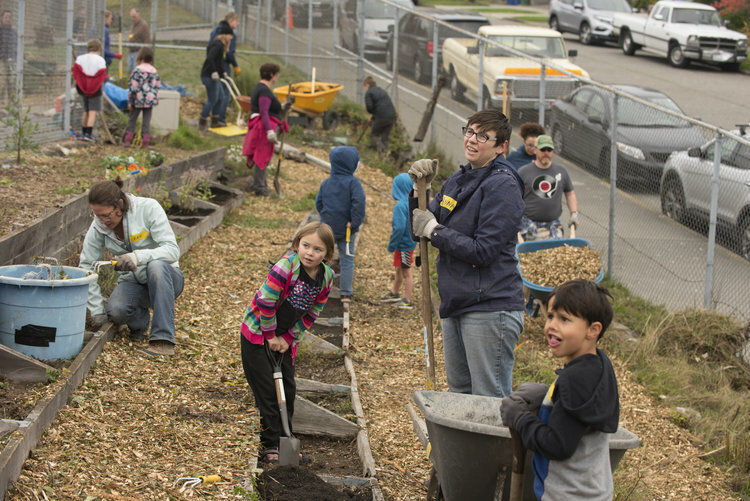 Removing impervious concrete surfaces, Hawthorne Elementary is using vegetation as a green-infrastructure solution to solve the playground’s frequent flooding and freezing problems. These new native tree and understory plantings will reduce stormwater runoff, provide shade, habitat for animals and help clean the neighborhood’s air. The Friends of Hawthorne PTA still has more work to do. This summer, the project is conquering more depaving and tree plantings — keep up to date on their project or volunteer at future events!